CLICK HERE to see a 1 minute Slide Show of the Robot. Advanced Fibermolding, Inc. has one of very few robotic waterjet cutters in the world that is not directly involved in the automotive industry. 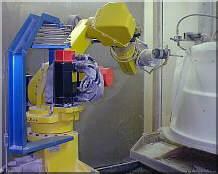 Precision cutting and rapid production are insured when contracting to use this high tech machinery. Our Research and Development Group works hard to find the best solution for You! We can take your print or sketch, help determine the best process for you, and then design and build tooling that will allow us to get your parts up and running. We can vary the properties of our composites to suit your needs.